Blueberries are in season! If you don’t have fresh ones yet, grab your frozen ones from the last harvest, your tequila, and your lime, to whip up a Blueberry Margarita! Is everyone ready for blueberry season? Here in South Georgia, we are! Blueberries can be harvested between April and late September so I am ready for the farmer’s market to start overflowing with fresh picked blueberries! I just opened my freezer and realized that I am down to 6 quart-sized bags from last year’s haul. My husband Brooks loves to eat them frozen. He will fill up a 22-ounce cup with frozen blueberries and sit and pop them in his mouth. I could never get my youngest, Connor, to eat them until his “Mimi” called them pops and made them fun. Now he likes them… Figures. I think I have just enough left until we can go blueberry pickin’ again to make a Blueberry Margarita! I will still buy the blueberries in the store when they are super cheap, as long as they are from Georgia, and freeze them too. They are so good for you and they make a very pretty smoothie. I will have to make some smoothie recipes for Summer. 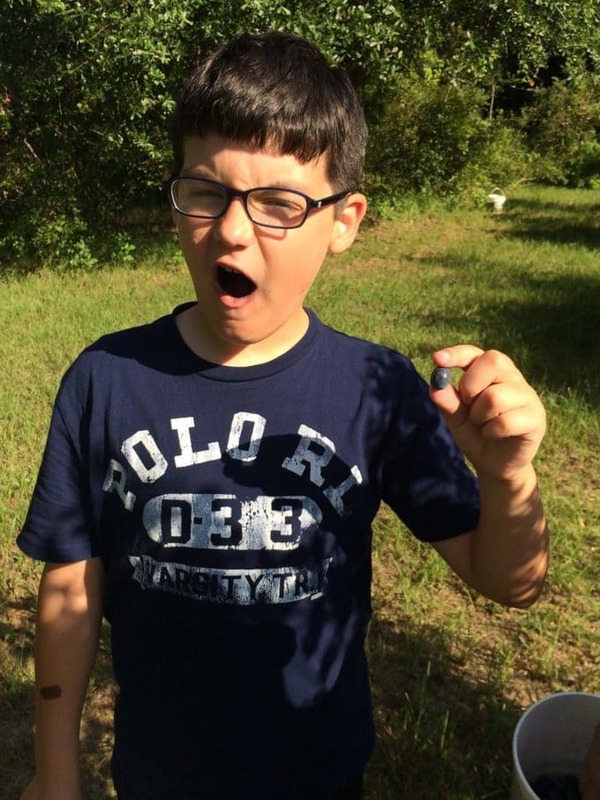 Here are a few pictures from our blueberry pickin’ from last summer! I am using a bag of frozen blueberries from our haul. Braxton couldn’t believe how big they were. Connor just wanted to keep the neck buckets and play with them in the tub! 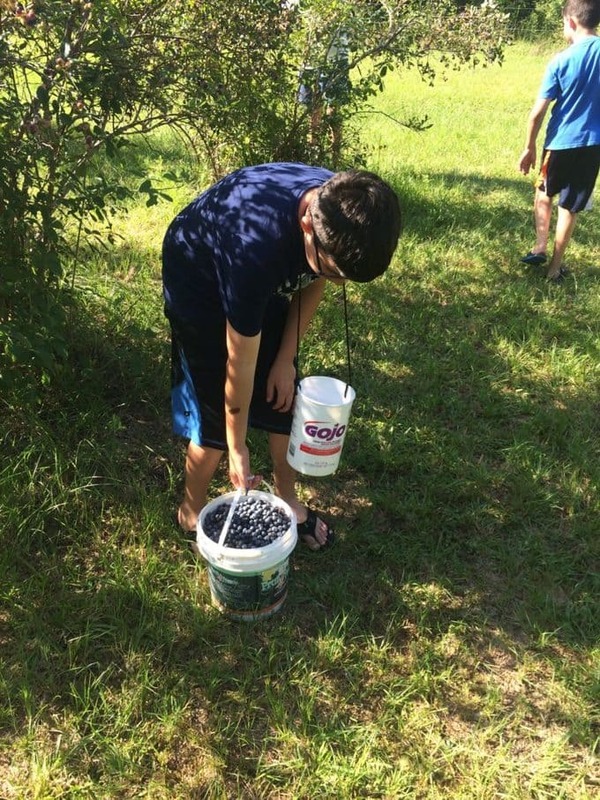 We filled up two of these buckets so we had a ton of blueberries!! If you don’t happen to have access to fresh blueberries, don’t worry. I used frozen blueberries to make this blueberry margarita so I can make it all year long and I think everyone has access to frozen blueberries in their grocery stores. This blueberry margarita has all the traditional flavors of the classic margarita with the tangy sweetness of blueberries. I don’t use the “margarita mix” for this because I think it is too sweet and it usually has a lot of corn syrup/chemicals in it. I also didn’t use margarita mix for my Margarita Bars and my Margarita Dip. From scratch is the best! You don’t need to use the pre-made stuff as it is pretty simple to make a margarita with just a few ingredients. Lime juice (fresh-squeezed is best), tequila, orange liqueur (triple sec) or you can use a bit of orange juice, and some simple syrup. The blueberry puree that I use in this recipe is easy to make. Just mix some frozen blueberries and water in a blender until smooth. It will be like a blueberry smoothie:) I like to use the puree instead of just macerated blueberries because it makes it colder and you can use less ice. You can also just use the frozen blueberries as ice if you prefer not to use ice cubes all together. I know that some people don’t like to use ice because it melts and waters down your drink but, quite frankly, I drink mine too fast for that to occur. 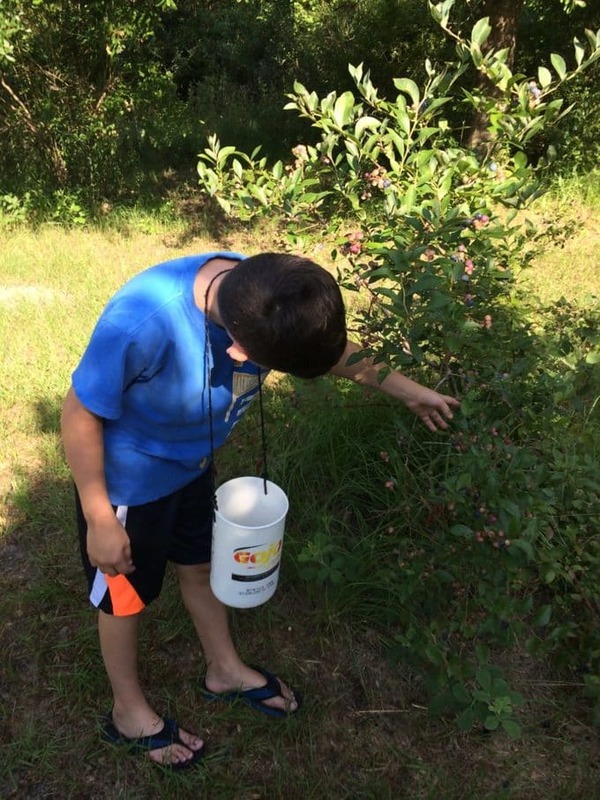 Grab your blueberry pickin’ buckets (or shopping carts) and grab some blueberries. This blueberry margarita should be in your hand PRONTO! Combine the frozen blueberries and water in a blender. Pulse in a blender until all the blueberries are chopped up. Combine the water and the sugar in a small pot. Heat over medium heat until all the sugar is dissolved. Combine the tequila, blueberry puree, triple sec, simple syrup, and lime juice in a cocktail shaker. Pour the soda into the shaker and stir by hand. Pour into 6 glasses with ice. Garnish with salt, lime wedges, and frozen blueberries if you like. This cocktail looks delicious! Thanks for sharing your recipe at Craft Frenzy Friday at Mom Home Guide! Looks so pretty & sounds so delicious! Thanks for sharing at the Inspiration Spotlight party. Pinned & shared. Even though it is 10:30 on a Sunday morning i would like to have this drink RIGHT NOW! Pinned and shared. Thanks for sharing with us at Throwback Thursday! Sounds delicious and the pictures are devine! Great recipes, they look so refreshing, I appreciate a great margarita!! Not to sour not to sweet! Thanks Petra! Make sure you freeze some for later! I also definitely overload on blueberries when they’re in season — and then stock up with the frozen kind so we can enjoy them year-round 🙂 And these margaritas look like the perfect fun drink to sip on all summer long! Pinned! I love freezing them for later. Plus this way you don’t have to add ice! Just pop them in the freezer and use them when your no booze time is up. I need to do another one of those for sure!! Oh. My. Goodness. Trying this ASAP! Looks delicious!! Your boys are so sweet! I can so picture myself this weekend over looking the China Sea watching the sun set sipping on one of your delicious margaritas. Gorgeous photography! Sharing everywhere! Thank you so much! They are growing so fast! Come on over! 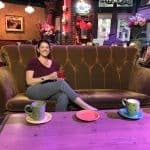 Lots to share! Pass a margarita my way! This is so pretty! Ooo, don’t these look festive! I’ve been enjoying blueberries lately, too, and can’t wait to give this recipe a try! Cheers! When we move to Pennsylvania we will have blueberry picking again–I am so excited. They do not grow where I live now. But in the meantime I have a lot of frozen blueberries that need to be used up and these look perfect! Frozen ones are just as good. They make great ice cubes! I didn’t realize you were in Georgia too. I am north of Atlanta and cannot wait for blueberries. We love to pick them. This will be my new favorite way to use them. We are about an hour west of Brunswick. Blueberry and pecan farms all around us! How amazing does this look. But don’t judge, I can not do tequila! So I may sub it out for vodka 🙂 HA HA! Sounds like a perfect summertime bbq drink!